The 12th annual Birth of Word festival brought together a collection of dancers, poets and performers who expressed the importance of self-care, treating others with love and using art as healing. Featured performer and professional poet Venus Jones stressed the important role art has in healing. The Cultural Arts and Diversity Resource Center (CADRC) organized the event, which took place on April 6 and 7 at Colleges Nine and Ten Multipurpose Room. The event included a variety of performances, of which four are listed, and was organized by a team led by student assistant production coordinator Joey Wong. Jones, a poet, author and actress, was recommended to CADRC by alumna and veteran performer Adilah Barnes and facilitated a creative writing workshop interspersed with performances of her spoken word pieces. She frequently invited audience members to share their thoughts and answers to the exercises she provided. 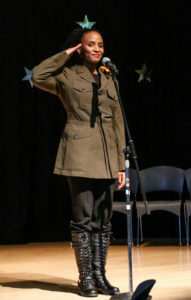 Dressed as a soldier with a large yellow flower resting in her hair, Jones marched in place to a spoken word poem she dedicated to Pablo Neruda, a Chilean poet who Jones said stood up for Black Americans when many Americans didn’t. “Sojourner Truth,” Jones said. “She rose,” the audience responded. “A Union spy with eyes on the back of her head who led over 1,000 people to freedom, Harriet Tubman,” Jones said. “She rose,” the audience responded. Spirituality and eroticism, though set against each other in some world religions, were intertwined in Jyoti Rout’s traditional Odissi dance from southeastern India. Rout performed for about an hour, her powerful foot stomps at times reverberating through the entire room. Her dances were based on stories from the Ramayana, an ancient Hindu historical epic, which she silently acted out, expressing emotions felt in everyday life. One story from the Ramayana she portrayed included onlookers’ disgusted reactions as they observed vultures eating dead flesh. She used strong facial expressions to supplement her intricate and artistic depiction of the story she danced to. “Odissi has become a global phenomenon,” said Annapurna Devi Pandey, a lecturer for the anthropology department who introduced Rout. 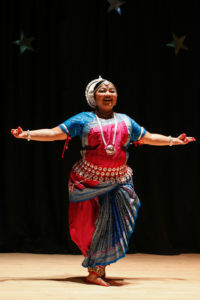 Pandey said the Odissi dance influenced the Bollywood dance genre. 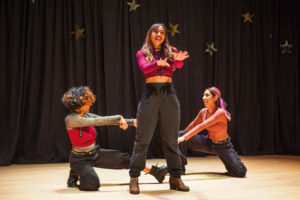 Dance and spoken word came together at the festival to create a powerful combination, as a feminist group of dancers and poets, called W.A.G.E. Art, performed their spoken word poetry while dancing to it. The group was composed of four alumnae from UC Santa Cruz. In their acts Born of Warrior Woman and Stay True, the group drew inspiration from the overwhelming pressures placed on feminine-identifying people. “Even diamonds are created under pressure,” a W.A.G.E. Art performer said to the audience, who sat enthralled at their dance. Performers listed peer pressure, pressure from mass media and pressure from family as sources that contributed to negative stereotypes and harmful expectations. The performance stressed that the time is now to rethink the way people look at African American men and women, and gave the students and the audience space to manage their frustrations with the world and spur action. The troupe wrote the performance themselves on the necessity of action in the face of a past and present filled with violence. “I was very impressed that they were a group of high schoolers already aware of all these social issues and performing it. That takes a lot of courage,” said UCSC undergraduate student Sophia Kang. 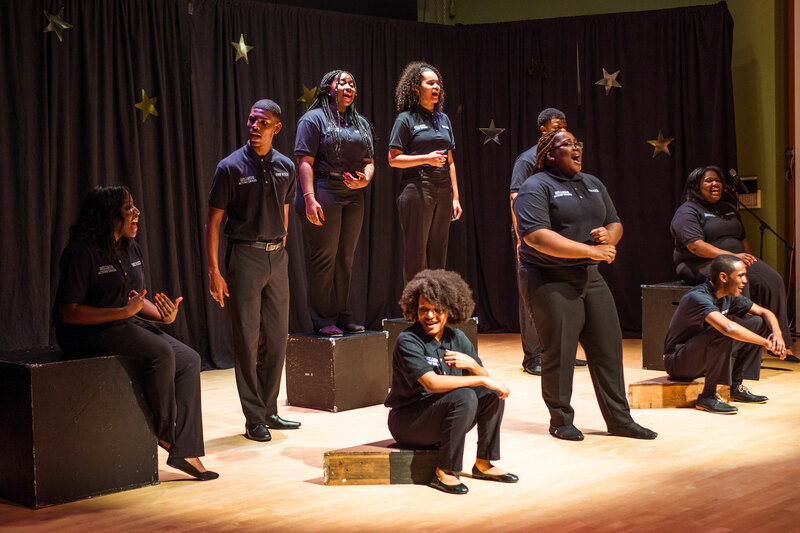 The students in One Voice felt frustrated during the performance with raising awareness of issues affecting Black communities in place of taking action.